Open All Year... A member of The Leading Hotels of the World, the Divani Caravel is the largest of the Divanis Chain Hotels, which has exemplified Greek hospitality for the last 45 years. The Divani Caravel is a luxury hotel ideally situated in the heart of Athens. 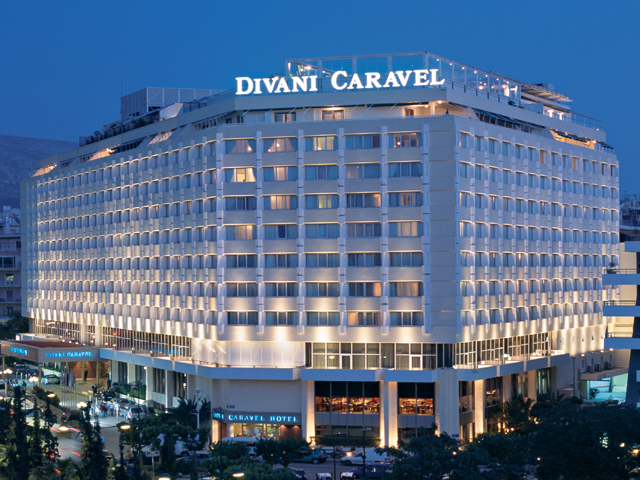 A member of The Leading Hotels of the World, the Divani Caravel is the largest of the Divanis Chain Hotels, which has exemplified Greek hospitality for the last 45 years. Fully renovated in 2003, the Divani Caravel epitomizes refinement, elegance, and exceptional service. Just like the magnificent city in which it resides, the Divani Caravel embodies the classic elegance of days past with the style and amenities of the present. The Divani Caravel Hotel is ideally situated in the heart of the city of Athens. Just minutes away from the business centre, the fashionable Kolonaki District with its exclusive Boutiques, Trendy Cafes, Restaurants and important museums, such as the Museum of Cycladic Arts and the National Gallery. Enjoy memorable meals with your stay at the Divani Caravel Hotel, in the exquisite restaurants. Whether it's a light snack, a quick drink with friends, or a multiple-course meal, the on-site restaurant facilities are sure to please even the most discriminating palates. The award winning staff is available at all hours with one sole purpose – to make sure that your stay with us is perfect. They are happy to provide a wide range of services and facilities to ensure your comfort at all times. Guests of the Divani Caravel have an assortment of leisure facilities and services that they can use for their enjoyment. If something that interests you is not listed, please feel free to inquire of the staff and they will gladly try to help you arrange for it. At the roof top swimming pool you can enjoy the magnificent view of the Acropolis and Lycabettus Hill and relax with a cool drink or enjoy a light snack from the Pool Bar. In winter time you can enjoy the same panoramic view, as the pool is covered and heated for indoor swimming. For a dynamic start to a productive day, use the fitness room. Or you can indulge yourself and just relax in the sauna or steam bath in the fitness area. The Divani Caravel offers 471 Rooms including 42 Suites and 2 Presidential Suites, each designed with the comfort and satisfaction of the guests in mind. Every room is recently renovated, well appointed with all the modern amenities, and stylish furnishings. Complimentary hot beverages, refreshments and snacks until 7 p.m.